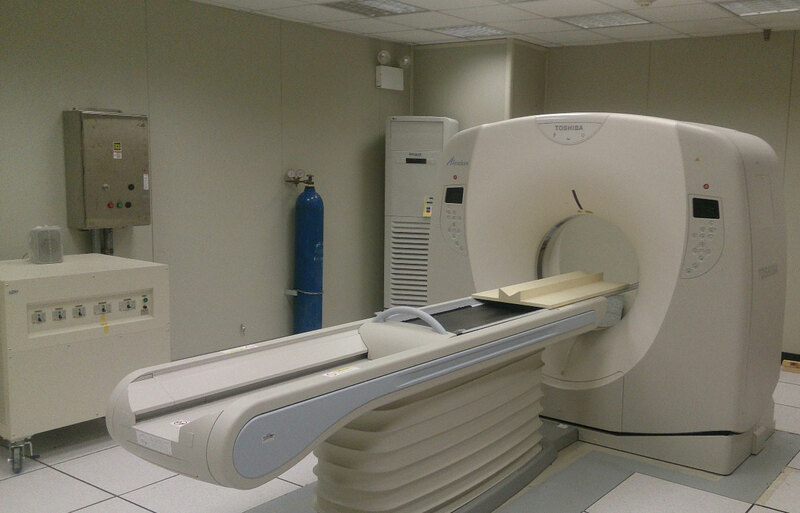 The lab has the capability to perform scans for whole rock cores using the latest Medical CT scanner: Toshiba Alexion TSX-032A medical X-ray CT scanner (resolution > 1 mm). The scans help to identify major fracs / wormholes inside the cores to better understand the features of the rocks. Images obtained from Medical CT scanner and Micro-CT in lab 6209 can be visualized in specialized software (Avizo, PerGeos) on a devoted workstation (Dell Precision Tower 7910; Dual Intel® Xeon®; 256 GB of RAM; NVIDIA® Quadro® K6000 12GB video card) to further segment and characterize the rock samples. Contact: Syed R. Hussaini for more info. Petrographic laboratory at CIPR houses three binocular Olympus stereomicroscopes and four state-of-the-art Olympus optical petrographic microscopes. 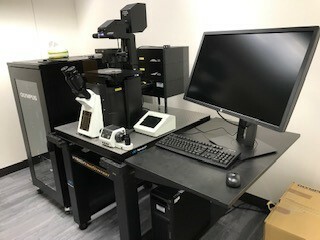 Two of the optical microscopes are equipped with high definition Olympus cameras linked to imaging software for capturing thin section photomicrographs. The laboratory is used for studying rock samples slabs, core plugs and petrographic thin sections to identify rock fabrics, mineralogical composition, textures, microstructures, and pore types, and conducting pore visual estimates. The excellent facilities that exist in the laboratory allow researchers and students to carry out high-quality petrographic studies. These types of studies are applied in hydrocarbon source rock, reservoir and aquifer characterization, and mineral exploration. Over the years we have rendered research and contractual services to Saudi Aramco and multinational oil companies operating in the Kingdom of Saudi Arabia. depends on the Backscattered Electron (BSE) and Energy Dispersive (EDS) X-ray data to automate image analysis. QEMSCAN uses a combination of database and elemental chemistry to identify minerals and produce digital images at each point. It is mainly operator independent and time efficient and. It generates reproducible and statistically valid results. This is an oil and gas laboratory for the measurement and analysis of advanced fluids. 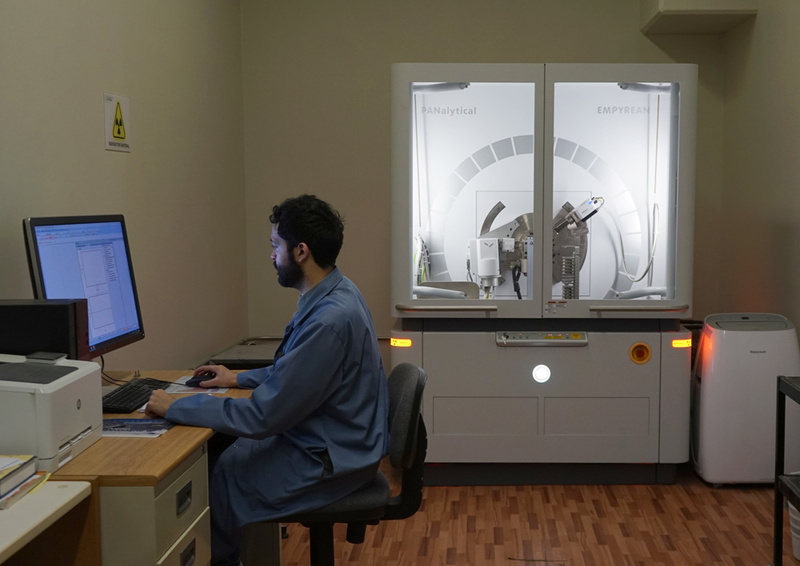 Experimental studies on complex fluids in this laboratory are targeted towards heavy oil recovery in oil fields and a good understanding of the reaction kinetics and mechanism between the stimulation fluid and reservoir rock. The PVT and RDA systems are the two major equipment for characterizing fluid samples in this laboratory. Contact: Dr. Muhammad Kandill for more info. 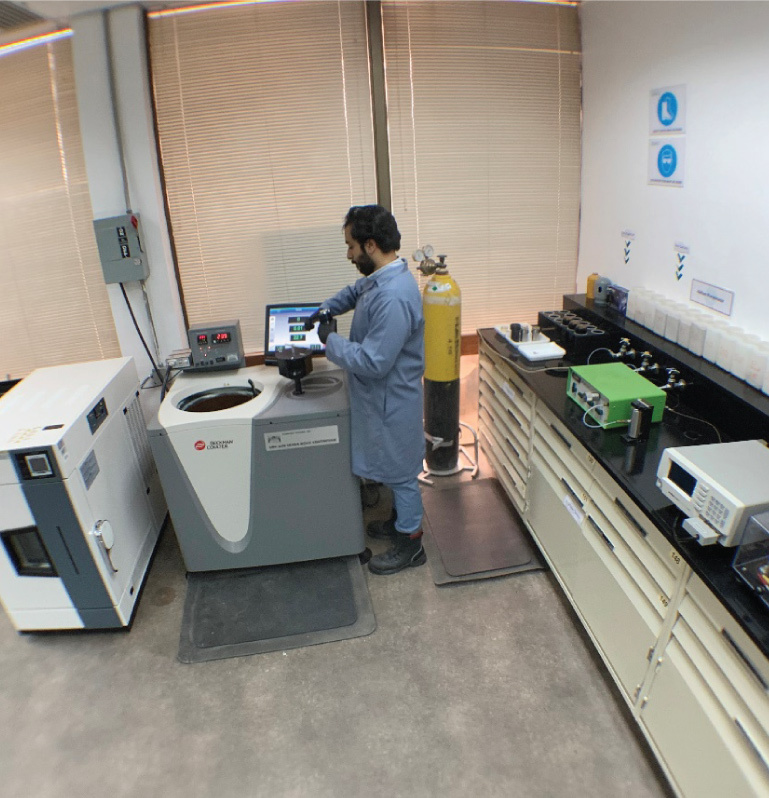 The Analytical Lab provides expert analytical testing and characterization services to the CPG-CIPR research community using a wide range of advanced analytical instrument s. Available facilities include an ICP-OES, GC, Particle Size Analyzer, HPLC, TGA, FTIR, and Refractometer. 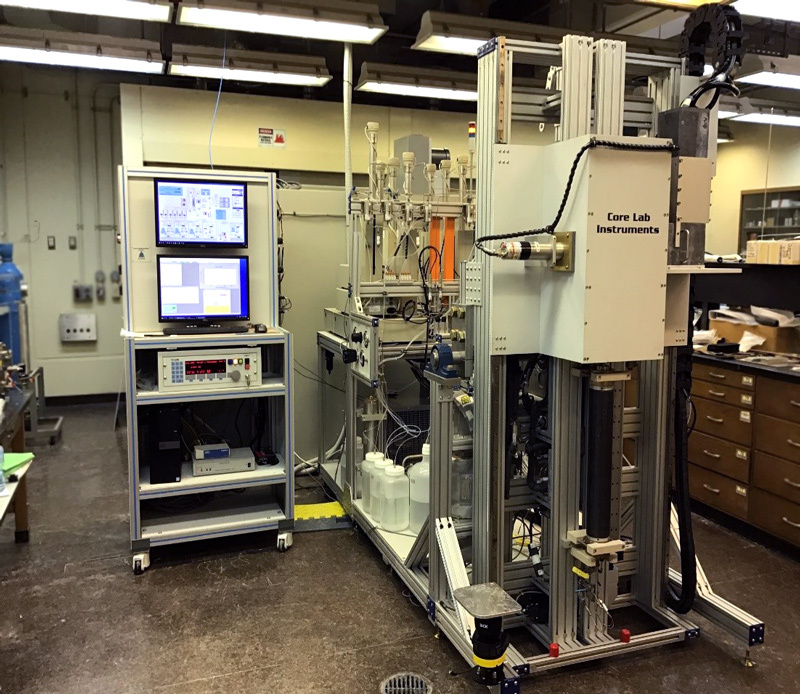 The lab uses advanced technique for custom and routine chemical analysis of petroleum (crude oil and other hydrocarbon products), gas, oil field chemicals (polymers, surfactants), rock/clay samples, and petroleum fluids (brine and produced water). 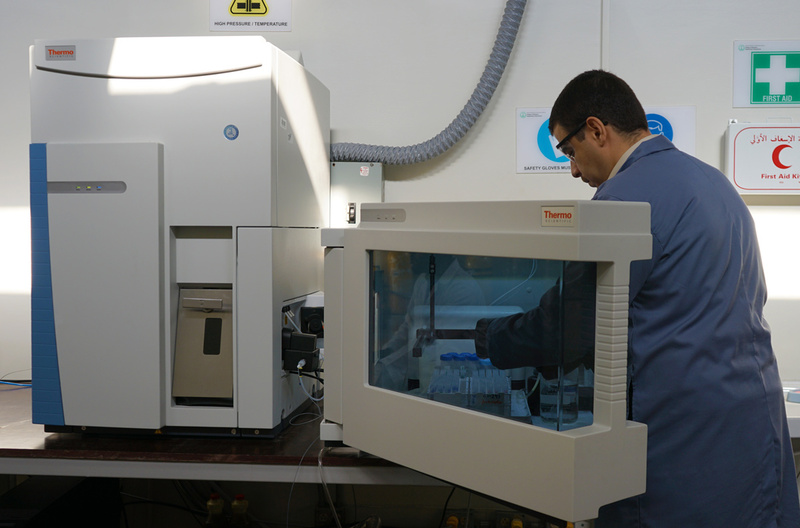 LC-MS is an analytical technique that combines the physical separation capabilities of high-performance liquid chromatography (HPLC) with the additional capabilities of Ms-Ms mass spectrometry. The latter enables the determination of molecular weights and complex structures via the mass selection with one mass analyzer and mass characterization with a subsequent one (Ms-Ms). The chromatographic columns in place can separate multicomponent mixtures and there it is possible to provide the structural identity of the individual components. 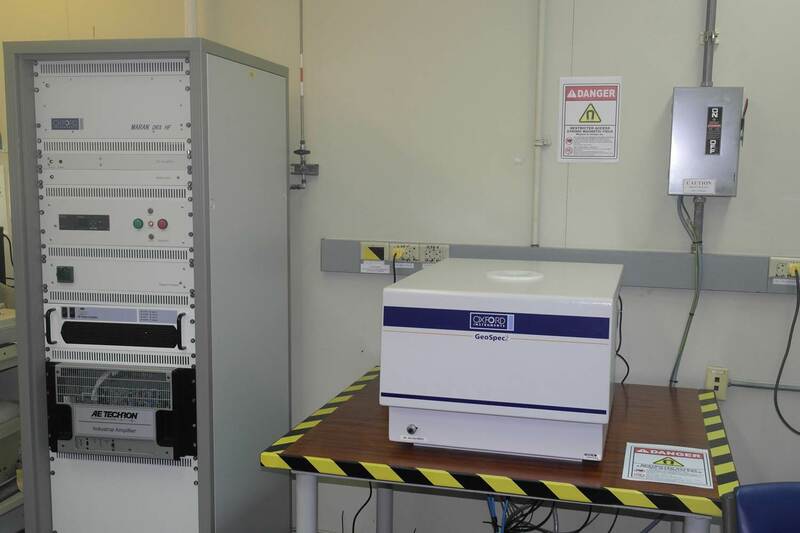 In addition, the instrument is also equipped with a state of the art Diode Array Detector (DAD) and an Evaporative light scattering detector( ELSD). 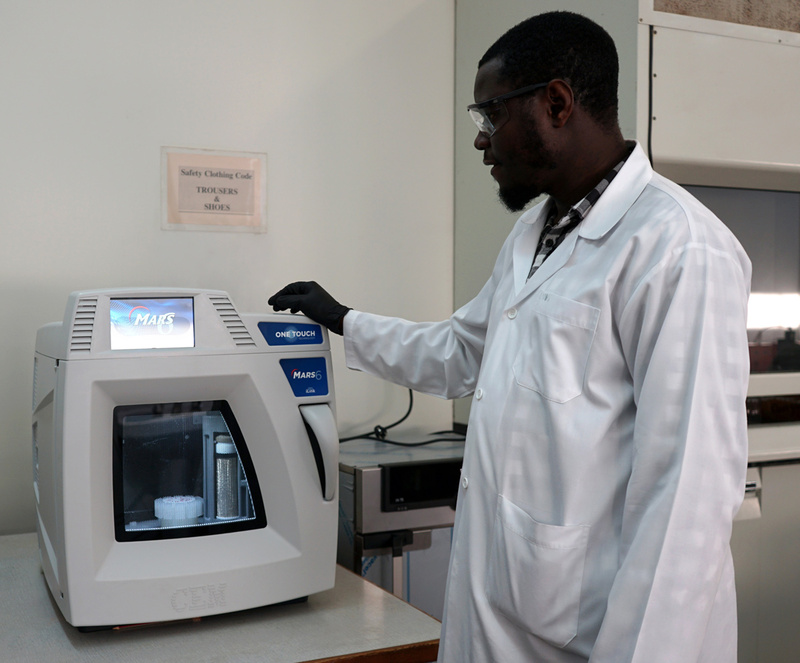 The equipment will be utilized in quantification and structural characterization of newly synthesized materials. Contact: Dr. Jimoh K. Adewole for more info. 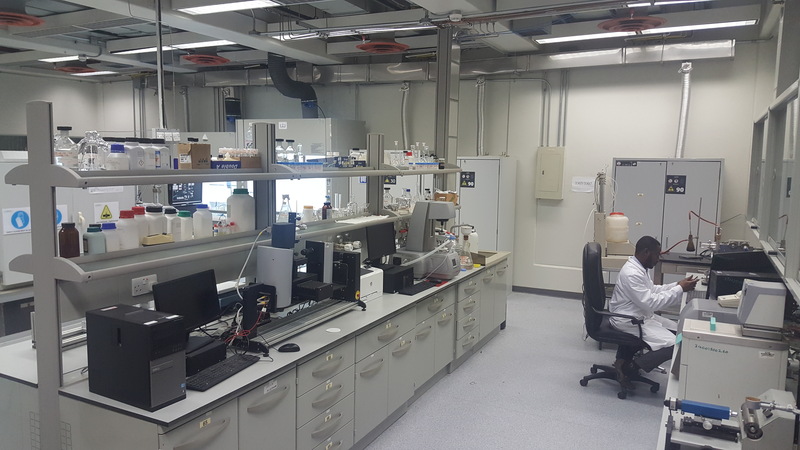 This laboratory is equipped with state-of-the-art equipment required to assess the performance of chemicals used in tertiary oil recovery such as surfactants and polymers at reservoir conditions. 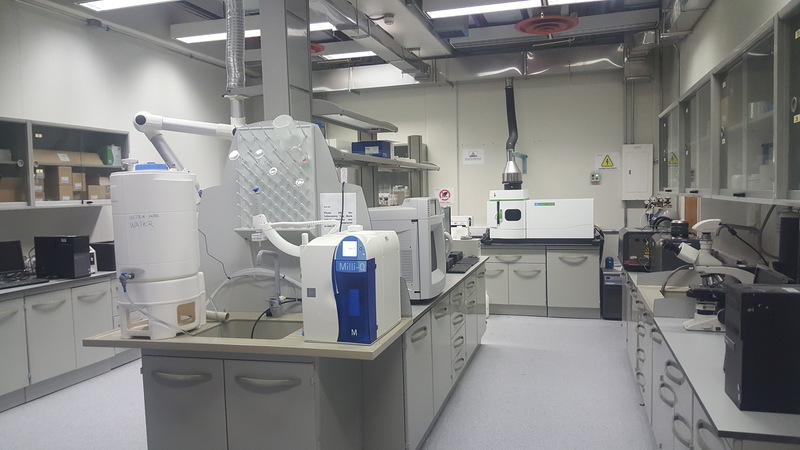 The laboratory also has a high-pressure rheometer, which is useful in the evaluation of the rheological properties of polymers and surfactants at reservoir conditions. 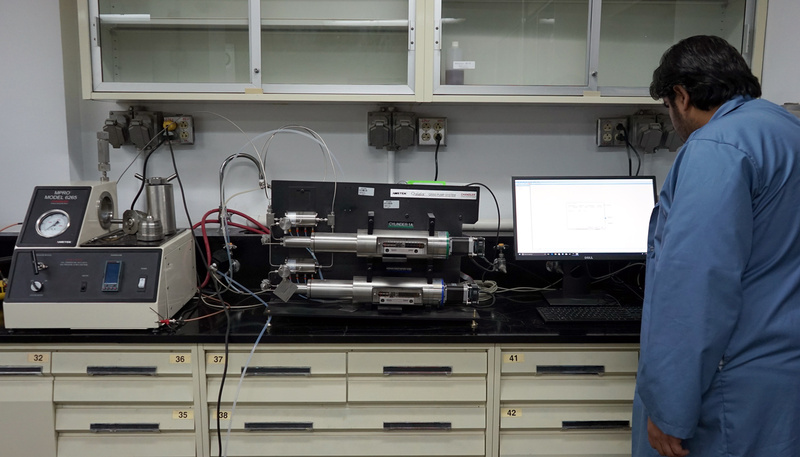 Three interfacial tension equipment are also available for the characterization of solid-liquid and liquid-liquid interfacial properties at different conditions. The laboratory includes a core-flooding system (CSF-700), which can perform oil recovery experiments with corrosive liquids and gasses. APBC-300 is a first of its kind equipment designed by Eng. Xianmin Zhou in a period of two years. This equipment consists of four independently operated, fully visual HPHT Hastelloy cells connected to four accumulators and a moveable high-quality zoom camera. It can be used to study: phase behavior, emulsions and foaming at reservoir conditions (max 10,000 psi and 150°C temp). Contact: Dr. Muhammad S. Kamal, Ahmad Mahboob, or Lionel F. Tally for more info. This laboratory is dedicated to the synthesis of alkaline, surfactants, polymers, chelating agents etc. The synthesized products have different oil field applications including acid diversion, well stimulation, and enhanced oil recovery. 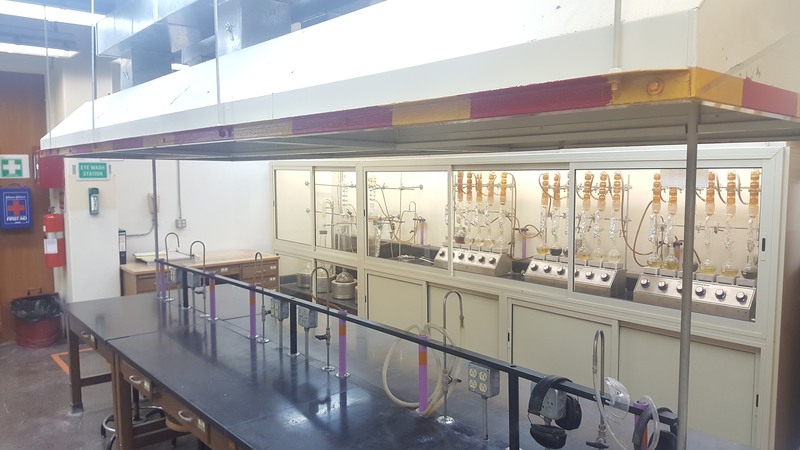 The laboratory has recently been renovated with two well-ventilated fume hoods to provide personal protection against toxic vapors, fumes, and dust. The laboratory is fully equipped with the required chemicals, solvents, ordinary supplies, and glassware for the synthesis of products. Contact: Dr. Syed M. Hussain for more info. 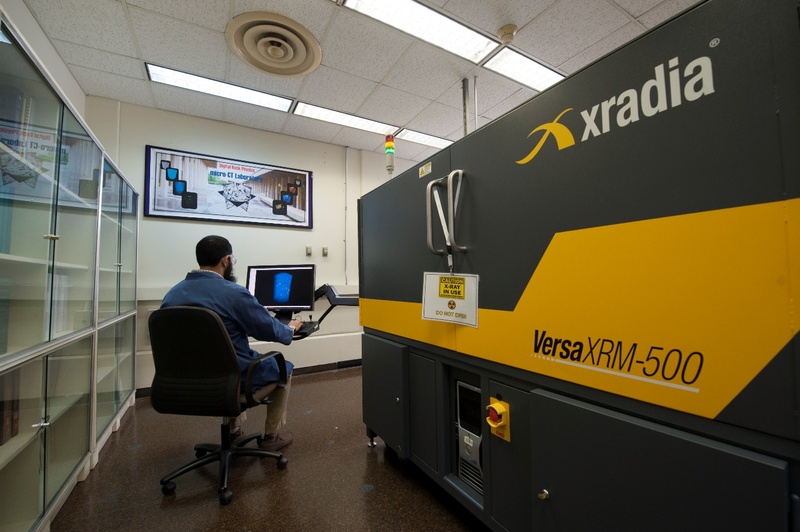 The lab has the capability of imaging and digitization of rock samples using micro-CT scanner: Zeiss VersaXRM-500 X-ray micro-CT scanner (True Spatial Resolution™ > 0.7μm). Micro-CT imaging enables assessment of the internal structure of the rock samples and their pore systems at various resolutions 1–50 micrometer. Micro-CT imaging provides us with a representation of the rock sample for reference and future use in digital rock physics studies. 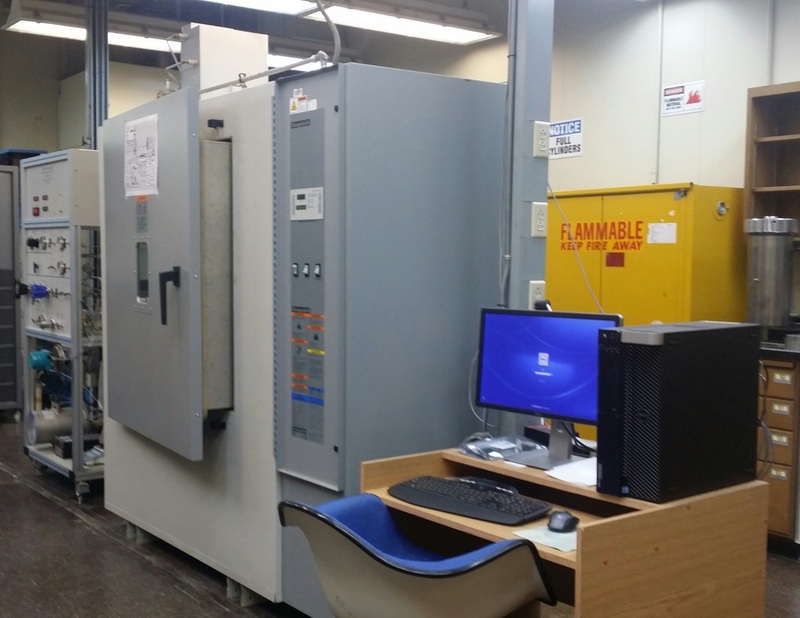 The electrical resistivity lab is equipped with facilities that enable us to carry out various rock electrical resistivity studies on core samples at ambient and reservoir conditions. The lab capabilities include determination of electrical parameters (Archie parameters) of rock samples, ability to conduct various kinds of research work that require measuring rock electrical resistivity during core flooding experiments, capillary pressure measurements using porous ceramic plates, measurement of resistivity of fluids such as brine and slurries, and others. The lab has in the past conducted various kinds of client-funded research projects and has interesting research works in progress. Contact: Dr. Abdulrauf Adebayo for more info. NMR rock analysis provides information about important properties of the rock, such as: Porosity, Effective porosity; BVI, CBW, FFI; Permeability relationship; Pore size distribution; Hydrocarbon typing; Viscosity; Total liquid volume (oil + water); Tortuosity (by way of diffusion); Wettability; and Diffusion distribution. 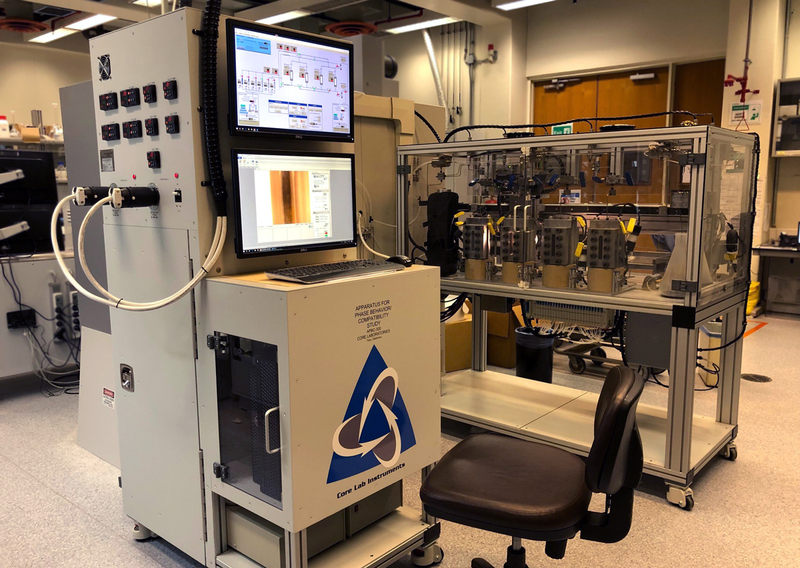 CIPR currently hosts Oxford Instruments' Geospec2-75, operating at 2.2 MHz frequency with the capability of testing cylindrical samples of up to 2” diameter. It is complemented by the GIT Systems Advanced software which allows simple repeatable experiments as well as a set of advanced state of the art NMR applications. An overburden cell is also being purchased to perform NMR measurements at reservoir conditions. 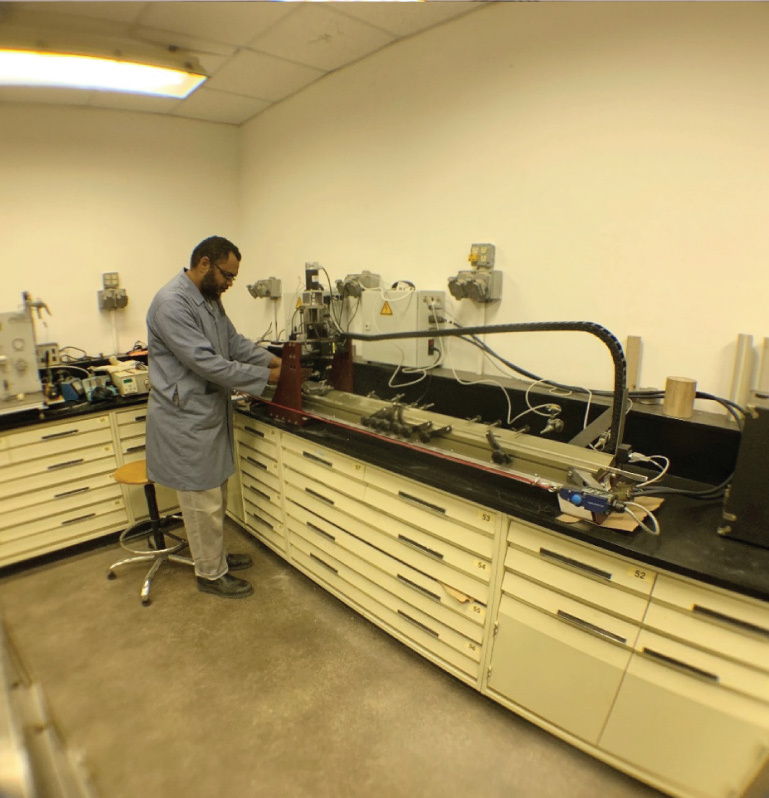 The rock mechanics lab is equipped with the state of the art facilities for testing the mechanical properties of rock samples. The following tests can be conducted at ambient and reservoir conditions: dynamic test (compressional and shear waves), unconfined compression test (UCS), triaxial test (drained, undrained, jacketed, single stage, multi-stage, hydrostatic compression), rock compressibility, Brazilian test, and others. The lab has in the past conducted various kinds of client-funded research projects and has interesting research works in progress. The apparatus can be operated in a vertical and horizontal position and any angles in between at working temperature of 150°C and pore pressure of 6000 psi for measuring steady state (SS) relative permeability and saturation profiles using automated linear X-Ray scanner when two phases or three phases flow simultaneously in the core plug. Unsteady state (UNSS) displacing test can be conducted for monitoring saturation profiles during water flooding, chemical solution, gas, and supercritical CO2 injection. Contact: Mr. Xianmin Zhou for more info. 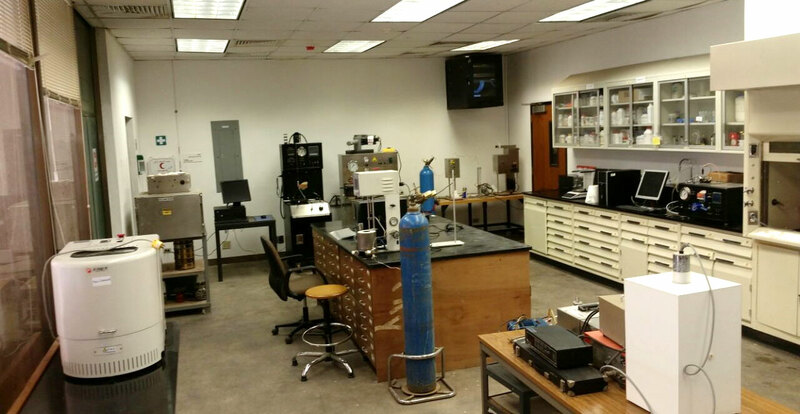 This lab is dedicated for Enhanced Oil Recovery (EOR) flooding tests at steady and unsteady state conditions. The system is designed to measure oil/water or gas/oil relative permeability at reservoir conditions. Contact: Sarmad Z. Khan for more info. This lab is dedicated for EOR flooding tests at unsteady state status. The system is designed to measure the relative permeability of oil/water or gas/oil systems at reservoir conditions. In addition to that, a mercury injection system (Porosimeter) is located in this lab to measure the capillary pressure up to 60,000.0 psi. The system is capable of providing pore volume and pore size distribution. Contact: Redha Alabdrabalnabi for more info. This lab is dedicated to measuring the capillary pressure as well as wettability state reservoir rock by using Roc-fluid Centrifuge. In addition to that, an Automated Porosimeter/Permeameter is used to measure Ø and k at higher pressure up to 10,000 psi, and another Porosimeter to measure Ø at ambient pressure. Contact: Redha Al Abdrabalnabi for more info. 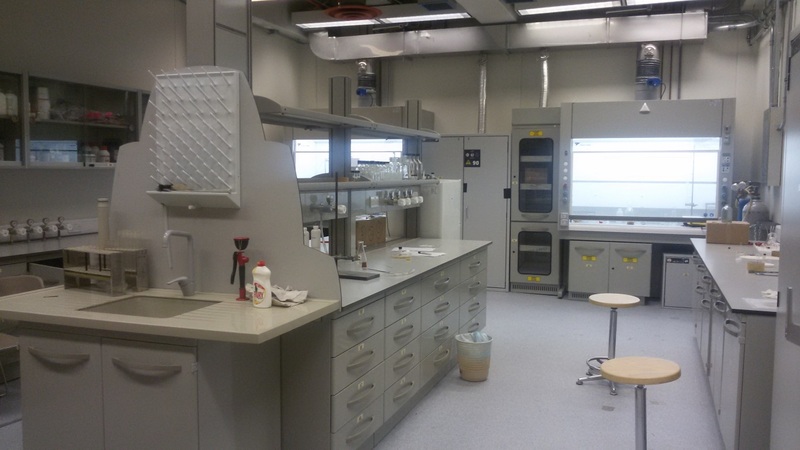 This lab is dedicated for thin section preparation. 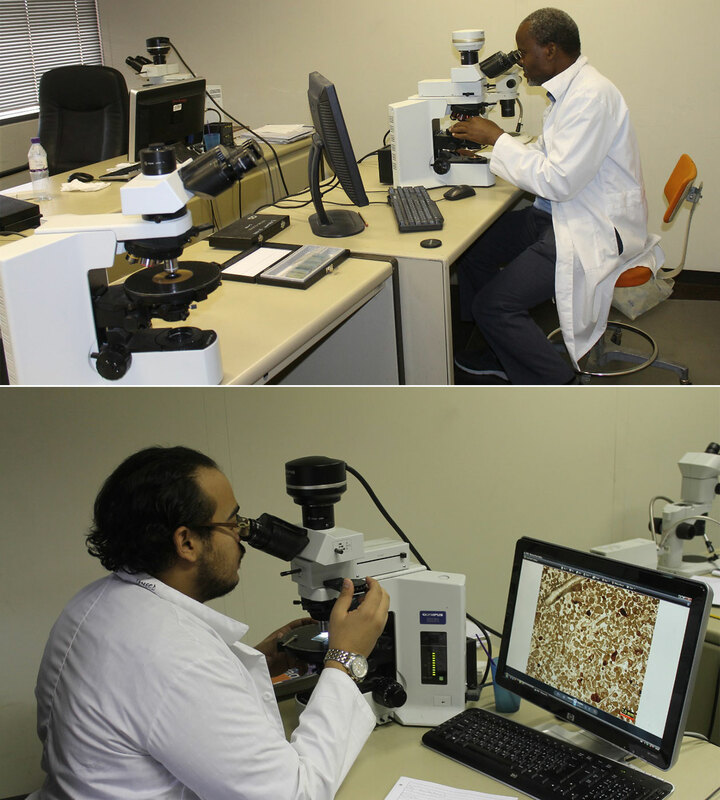 The laboratory is equipped with all kinds of equipment required for the preparation of thin sections, viz. Logitech (LP-30) polishing machine, Buehler PetroThin, Leco-MSX205 cutting machine, CS-10 cut-off saw, Microscope, and Fisher Isotemp Oven. Contact: Fyl Louie D. Panoy for more info. This lab is dedicated for cleaning core samples. 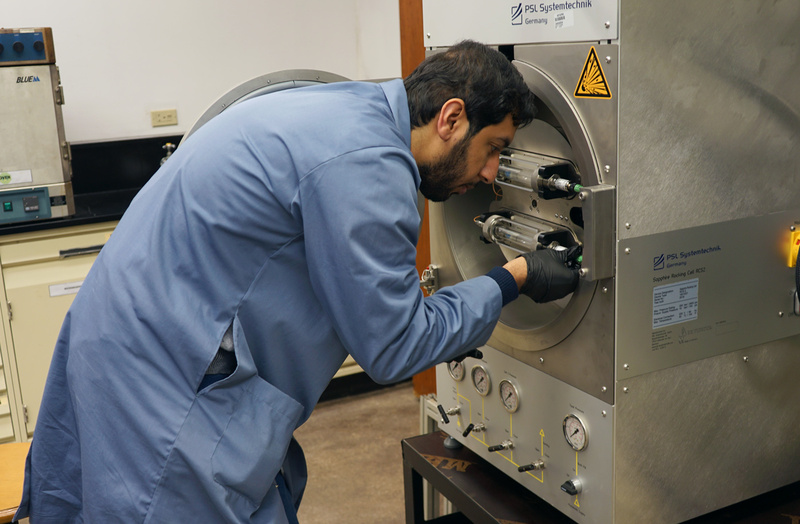 The lab is also equipped with a core cutting machine being used for cutting core samples. 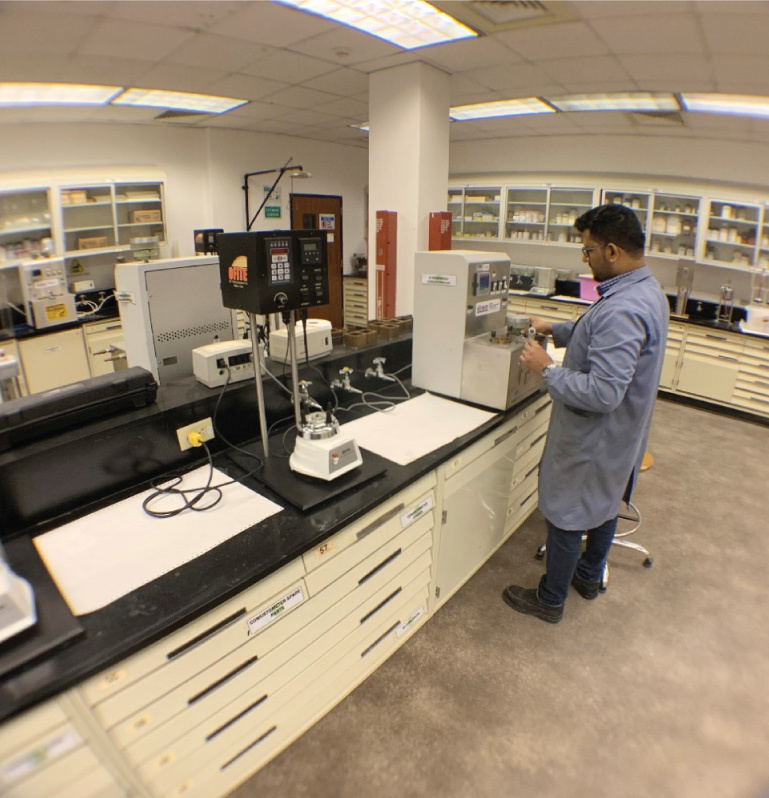 In this research lab, researchers are studying different properties of drilling fluids and cement slurries at HPHT conditions. The lab is equipped with state of the art equipment related to drilling fluids and cementing testing. HPHT Curing chamber is utilized to prepare cement specimens, or blocks, at high pressure and high-temperature conditions for compressive strength tests and cement characterization. HPHT Consistometer is utilized to measure the thickening time for cement slurries at high pressure and high-temperature conditions. The goal is to properly design cement slurry that can develop a compressive strength in an appropriate time by optimizing cement additives. Contact: Abdelmjeed K. Mohamed for more info. 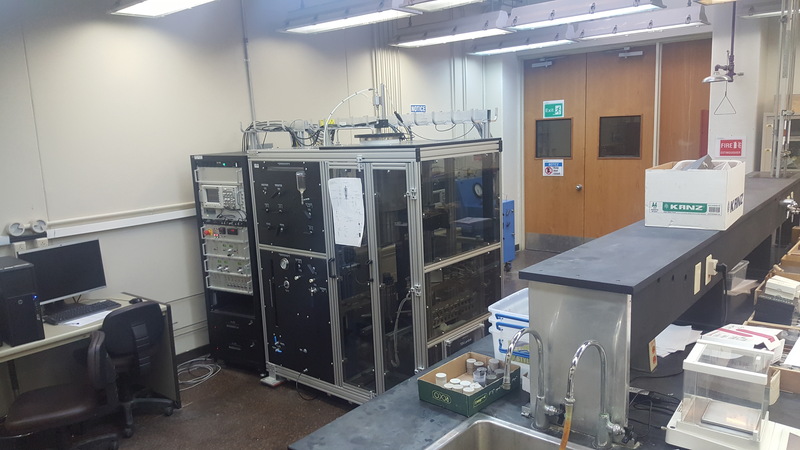 A research laboratory for graduate students where quantitative analysis of fluids is conducted. Analysis such as pH, conductivity, density, viscosity, etc. are measured. 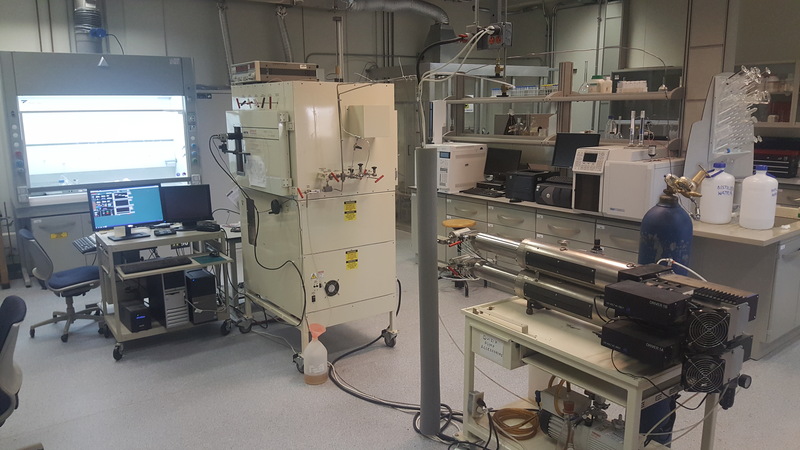 The Sapphire Rocking Cell is a laboratory instrument to research and test low-dosage hydrate inhibitors (LDHI), corrosion inhibitors (KI), AA and KHI and also multi-phases. Contact: Jafar Al-Hamad for more info. A new Faculty research Laboratory where experiments on core flooding, fracturing, acidizing, and enhanced gas recovery are investigated. 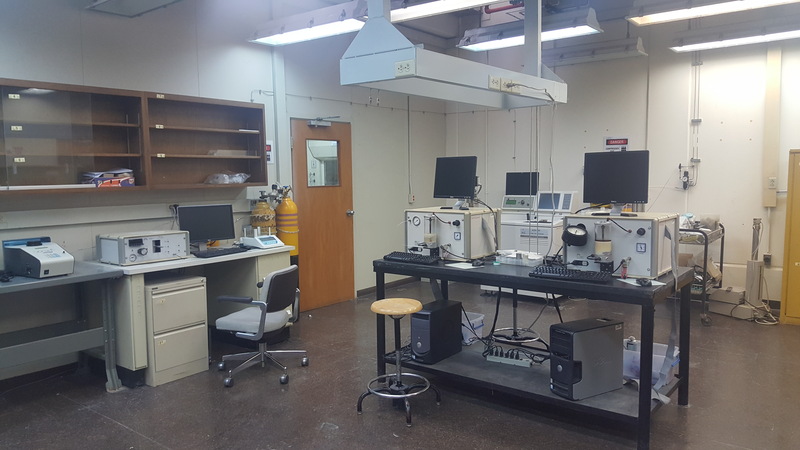 The laboratory is currently being equipped with the state-of-the-art equipment, with the objective of helping faculty funded projects, graduate thesis research work and undergraduate senior design research work. Contact: Ahmad Mahboob for more info. 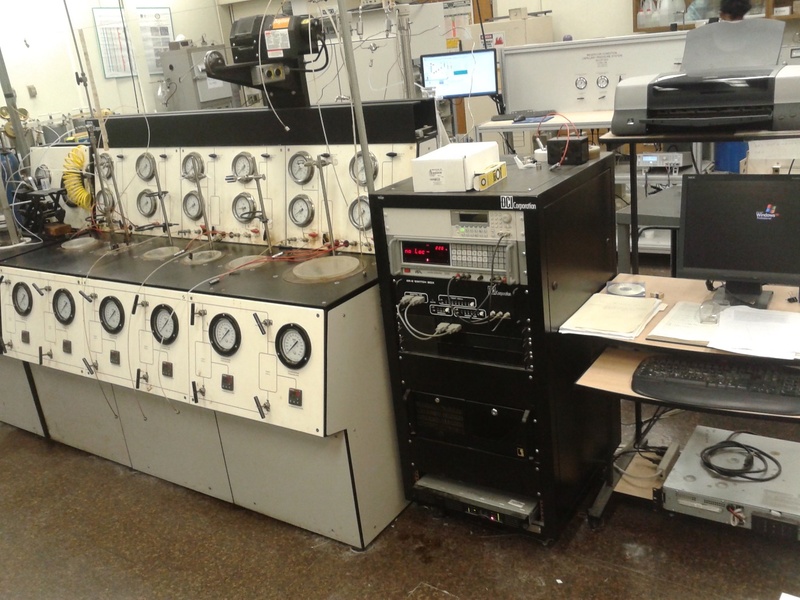 A research laboratory for graduate students where core acidizing tests are conducted. Stimulation fluids such as HCl, Organic acids, chelating agents, etc. are injected in different rock types such as sandstone, limestone, dolomite, chalk, etc. Core acidizing system is used to conduct stimulation treatment experiments such as injecting acid liquids, diverting agents, water shut-off gels, surfactant fluids, etc. It is capable of simulating reservoir conditions of temperature up to 350 oC and pressure up to 7,500 psi. Contact: Assad A. Barri for more info. 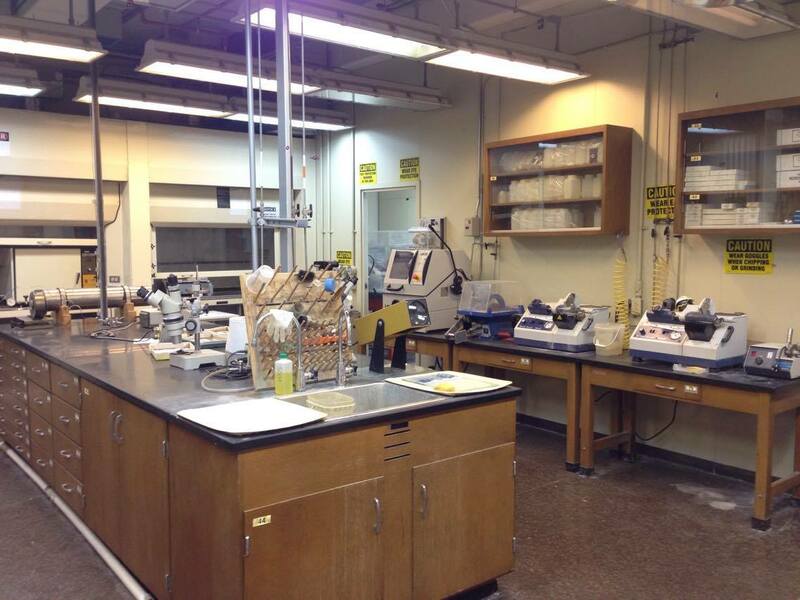 A research laboratory for graduate students where core flooding tests are conducted to enhance the oil recovery. Also, oil filtration and permeability measurement are conducted. 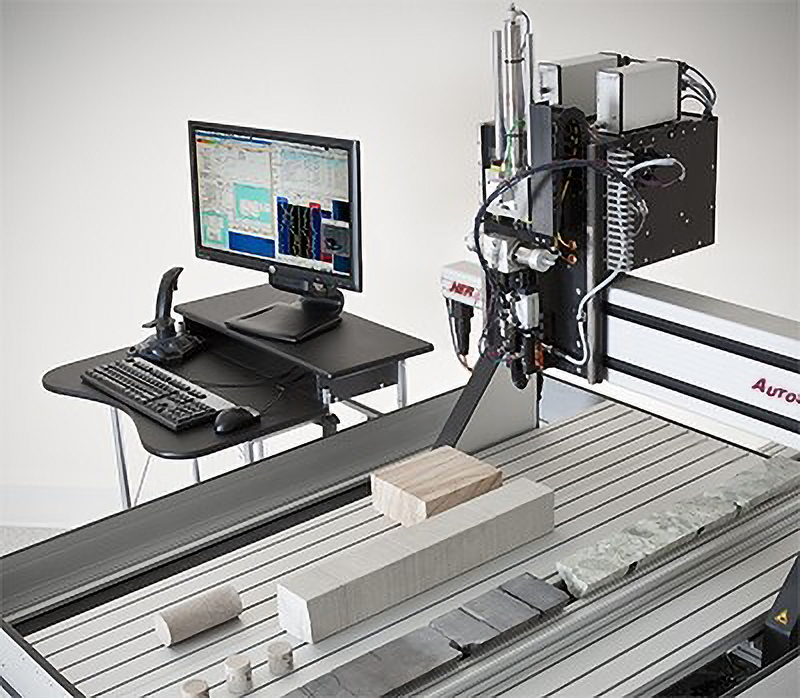 Scratch Test Equipment uses the scratch principle to measure the rock mechanical properties. It is used to estimate rock mechanical and elastic properties such as rock strength, shear stress, compressional waves (P-waves), shear wave (S-waves). A research laboratory for graduate students where innovative and creative research are conducted. Students build up their own research equipment for their thesis. Along with that, experiments in special core analysis can be conducted. MPRO measures the compressional and shear sound velocities through the cement sample and uses industry-accepted equations to determine the Poisson’s Ratio and Young’s Modulus. Contact: Ammar Al-Ramadhan for more info. It is a semi-automated, modular Core Flooding system that is configured for unsteady-state relative permeability tests. Core Flooding experiments in single and multi-phase displacements are available in manual and semi-automatic mode, an addition of the gas delivery system allow performance of gas displacement experiments. This system is specifically configured to take advantage of performing water flooding and simulation experiments. The base system is configured for liquid/liquid displacements under unsteady state conditions and the addition of the gas delivery system allows Gas/Liquid displacement experiments under unsteady state conditions or miscible flood experiments to be performed. Contact: Dr. Xu Liu for more info. In drilling fluids and cementing lab, petroleum engineering students are acquainted with the basic techniques of formulating, testing and analyzing the properties of drilling fluid and oil well cement. The Cement Atmospheric Consistometer is used for conditioning cement slurries as the slurry is subjected to down-hole conditions of elevated temperature under atmospheric pressure. From the recorded data, it also helps determine the slurry thickening time, free water content, fluid loss, viscosity, and other various rheological properties. Contact: Mobeen Murtaza for more info. Fluids Properties Laboratory is a teaching Laboratory where experiments about reservoir fluids properties (oil/gas) are conducted. These properties are vital to determine the amount of crude oil and gas in the reservoir, and the amount that can be lifted to the surface. The laboratory is equipped with state-of-the-art equipment in the petroleum industry and with the objective of helping petroleum engineering students to practically verify the theoretical aspects discussed in the classroom. Contact: Abdulsamed Iddris for more info. Rock properties laboratory main role is to measure the properties of core samples, providing a physical model of reservoir characterization.The measured data are used to define storage capacity (porosity), the magnitude and distribution of flow capacity (permeability), and fluid saturation, as well as lithology and other parameters. The URC-628 Ultra Rock Centrifuge is the newest generation of ultra high-speed rock-core centrifuges available to the core analysis laboratory for rapid determination of capillary pressure curves, sample preparation (for subsequent flow tests), relative permeability, and wettability determination using the Amott and USBM methods. With the data analysis package, the URC-628 can also be used to determine the capillary pressure curves and the relative permeability curves for the displaced phases in both the drainage and imbibition modes. Contact: Eassa Abdullah for more info. 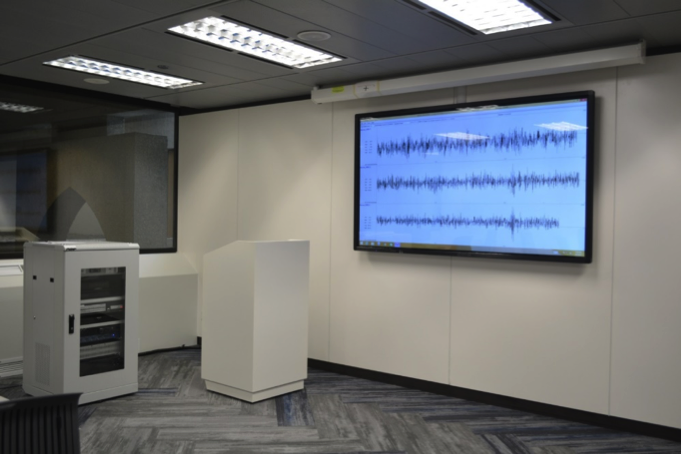 The Seismological Exploration lab is one of the state-of-the-art geophysical laboratories available as a teaching and research facility. 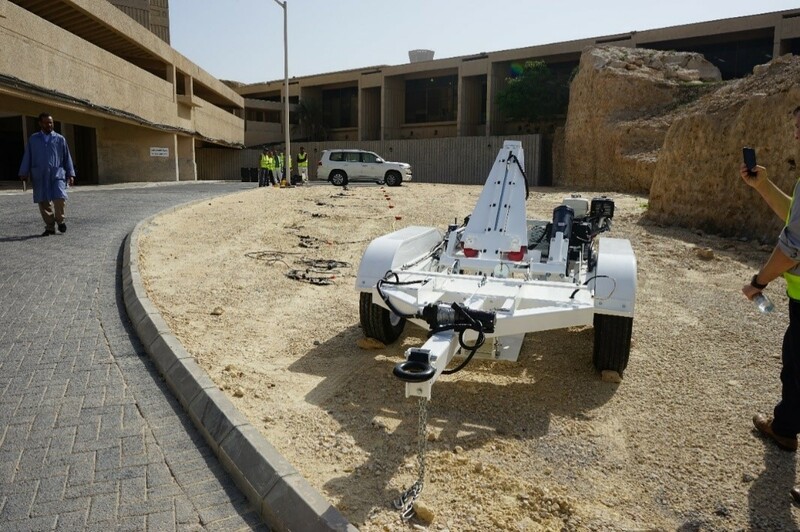 Students enrolled in Geophysics majors are exposed to the latest seismological exploration equipment, such as a 192-channels Geode system, Ground Penetrating Rader System, Vibroseis, High Energy seismic impact source, amongst others. ESS200 Turbo from GISCO, USA. Includes base system fully operational with handheld and trigger output, radio trigger link, wireless remote hand controller, Standard spare parts kit, 45-degree tilt mechanism. 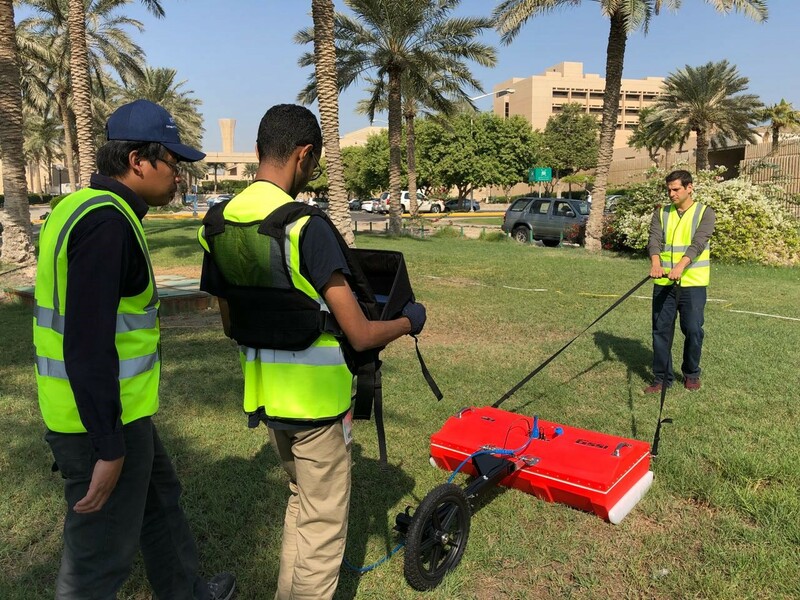 The SIR 4000 is a lightweight, portable, ground penetrating radar system that is ideal for a wide variety of applications and designed to operate GSSI single digital antennas, single analog antennas, or dual frequency antennas. The system includes various type of antenna frequencies e.g. Bi-static 100MHz, 400MHz, and MLF (Multi Low Frequency) antenna. Contact: Abdul Latif Ashadi or Ahmed A. Shaibani for more info. 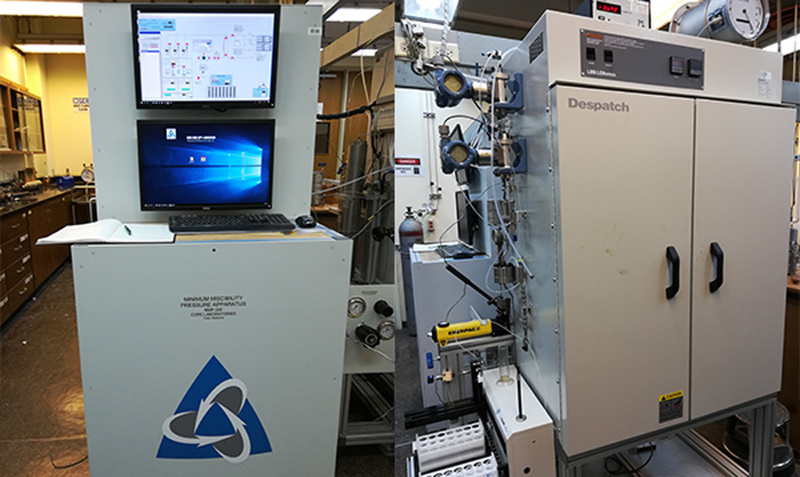 The Scan Electron Microscopy lab is one of the most important teachings and research facility for all undergraduate and graduate courses in Geosciences and Petroleum Engineering Department in College of Petroleum Engineering & Geosciences. 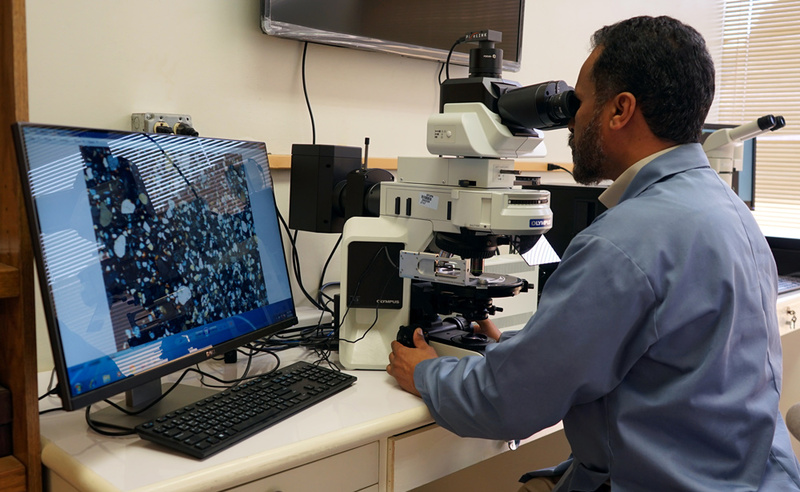 All basic and applied research of most of the faculty members specifically in the College of Petroleum Engineering &Geosciences depends on advanced research in quantitative characterization of minerals and elements and hydrocarbons which can only be accomplished with the help of scanning electron microscopy. The lab system is one of the High quality imaging and easy measurements, with large samples and high speed mapping with high resolution, and high throughput signal processing, Versatility and convenience by variable pressure and automatic chamber door higher speed by parallel processing and large SDDs with most advanced Esprit M4 TORNADO and X-Method software and Advanced mineral analysis with AMICS. Contact: Bandar Al-Otaibi, Dr. Khalid A. Al-Ramadan, or Mushabbab Q. Al Raqdi for more info. 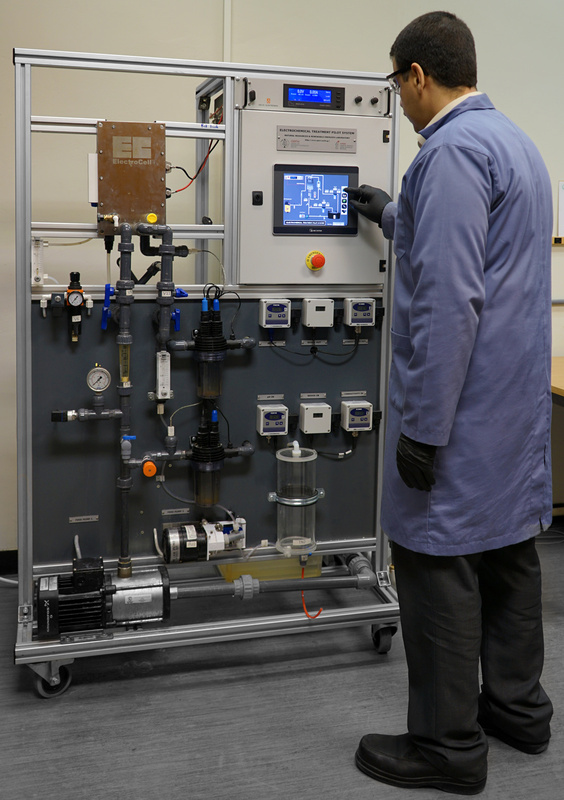 Electrochemical water treatment pilot plant systems utilize electricity to induce the removal of dissolved contaminants in the water such as organic and inorganic compounds. It’s treatment based on using different types of electrodes as cathode or anode in order to reduce the negatively or positively charged contaminants from water. 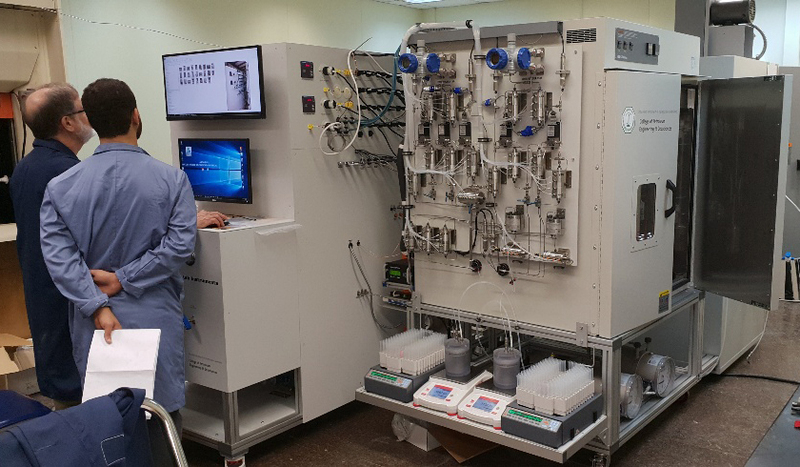 This pilot plant is complete circulation system contains several parts like a storage tank, water pumps, electrochemical cell, flow meters, sensors and measuring electrodes ( pH, ORP and Conductivity) and control panel with a touchscreen. The system is connected to a standalone power supply which allows manipulating the electricity parameters (like voltage and amperes) for an electrochemical cell. Contact: Tajudeen A. Oyehan or Eyad Safi for more info. Contact: Mushabbab Y. Al-Raqdi, Syed S. Hamid, or Eyad Safi for more info. The Geophysical Methods lab will provide you experience in making geophysical observations and analyzing data so that you can learn, first-hand about the physical structure of the Earth using various geophysical methods. There are many methods and types of instruments used in the geophysical surveys. Most of them are available in this lab, such as Gravity meter, Resistivity meter, Magnetometer, Electromagnetic and others. The CG-5 AUTOGRAV has a standard resolution of 1 microGal with a standard deviation that is < 5 microGals. It is the fastest, lightest, most cost-efficient gravity meter on the market today. This enables the Autograv to be used for both detailed field investigations and large-scale regional or geodetic surveys. 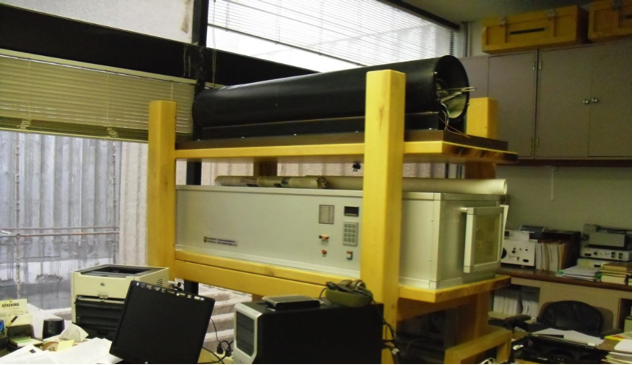 A high-end state of art Professional magnetometers for Magnetic Mapping System for Minerals, Petroleum exploration, and Geologic Surveys, will be highly used in teaching and for M.Sc., Ph.D. and faculty research. The Passive Seismic Exploration lab is one of the geophysical laboratories used by students and faculties to perform any research in the field of low-frequency seismic exploration. This lab is being equipped with a very large storage unit to cover huge data recordings. 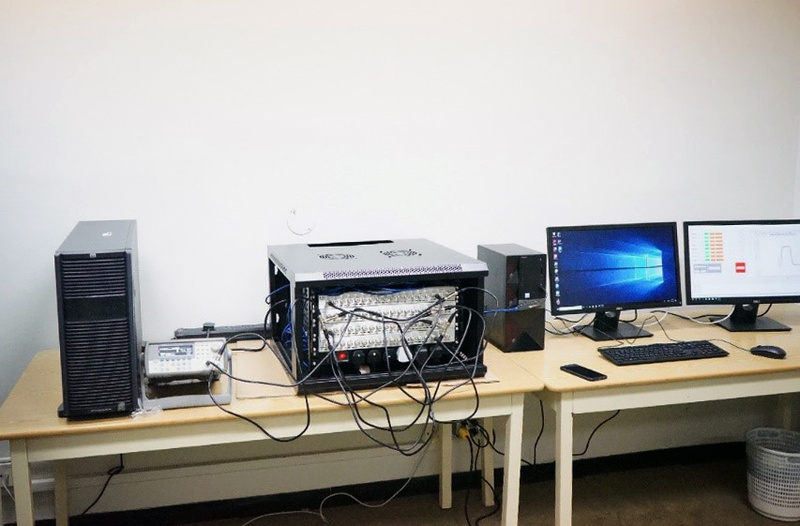 Some advanced systems are available in this lab, such as Geospace Seismic Recorder (GSR) Wireless Data Acquisition System and 64 Channel high-resolution Digital recording system. The Geospace GSR system is designed for cable-free and radio-free low-frequency seismic data recording. It delivers high resolution with a 24-bit delta-sigma ADC, has a built-in GPS receiver and a disciplined clock and can cover up to 30 days of continuous recording. 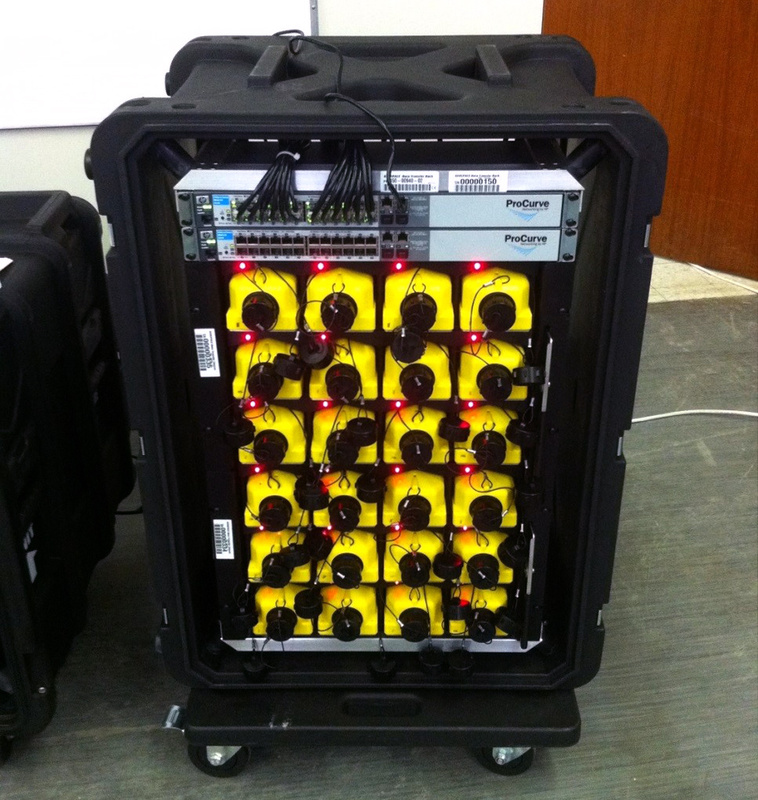 The 64 Channel high-resolution Digital recording system for geophysical simulation and data modeling. 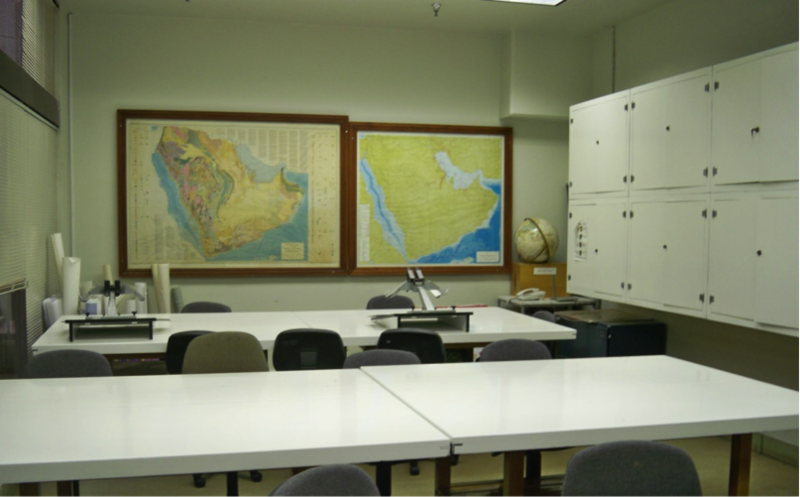 This lab is used by graduate students and faculty for research in the field of micropaleontology with reference to historical development and investigating micropaleontological and biostratigraphic analysis; survey of the major microfossil groups, their morphology, taxonomy, ecology, geologic distribution, evolutionary trends, and stratigraphic use, with selected problems from Arabia and nearby regions. 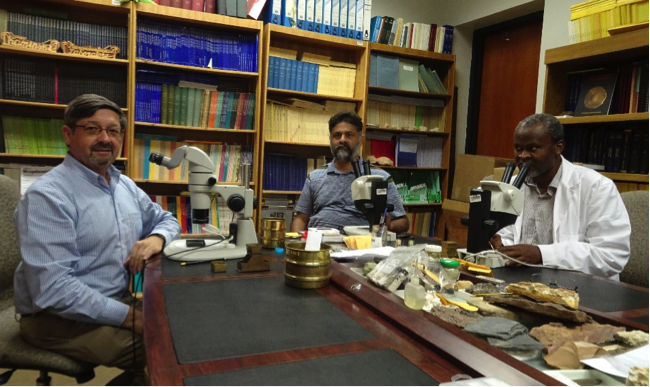 We also have the most comprehensive library of micropaleontological literature in the Middle-east. Contact: Mushabbab Q. Al-Raqdi for more info. Teaching faculty and research geologists in the department of geosciences use the facility to conduct extensive and detailed studies of the pore systems, diagenetic lithofacies and reservoir properties of various carbonate and clastic reservoirs in Saudi Arabia, the new research class microscopes allows the faculty and research students to systematically and properly carry out these tasks for evaluation of hydrocarbon fluid inclusions, and identification of opaque mineral under reflected and transmitted light. 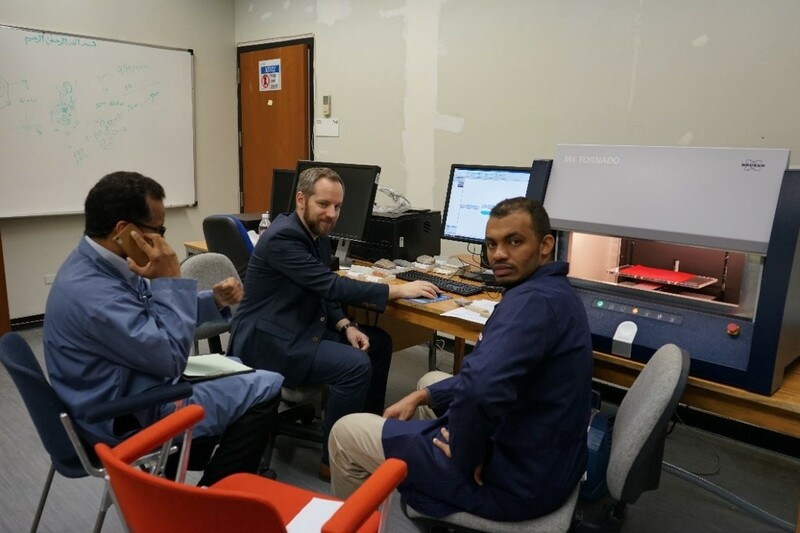 In addition, the PETROG software system for petrographic data capture, management, analysis, display and reporting with integrated camera and motorized high precision stepping stage is available at this lab location. Contact: Mushabbab Q. Al-Raqdi or Syed S. Hamid for more info. 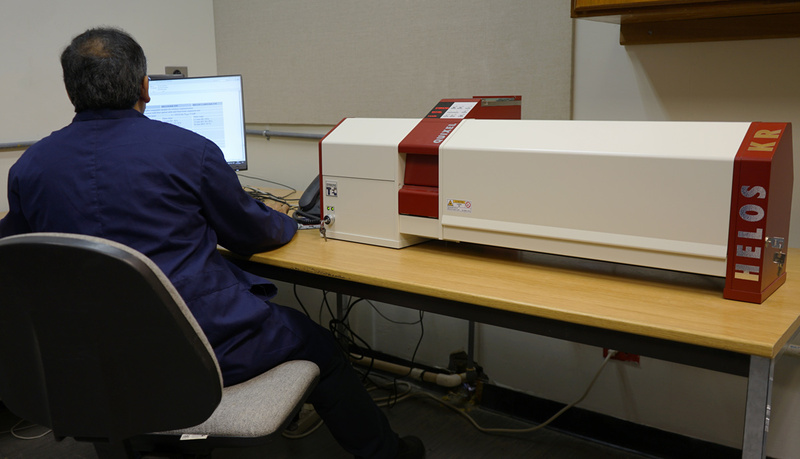 For advanced high-performance analysis with reliability and ultra-flexibility, measurements of inorganic contents (trace metals) in air, water or soil samples. In addition, this system is also used for teaching various Geology and ENVS courses in showing students how to asses environmental impact and pollution problems. Contact: Mushabbab Q. Al-Raqdi or Syed S. Hamid or Eyad Safi for more info. 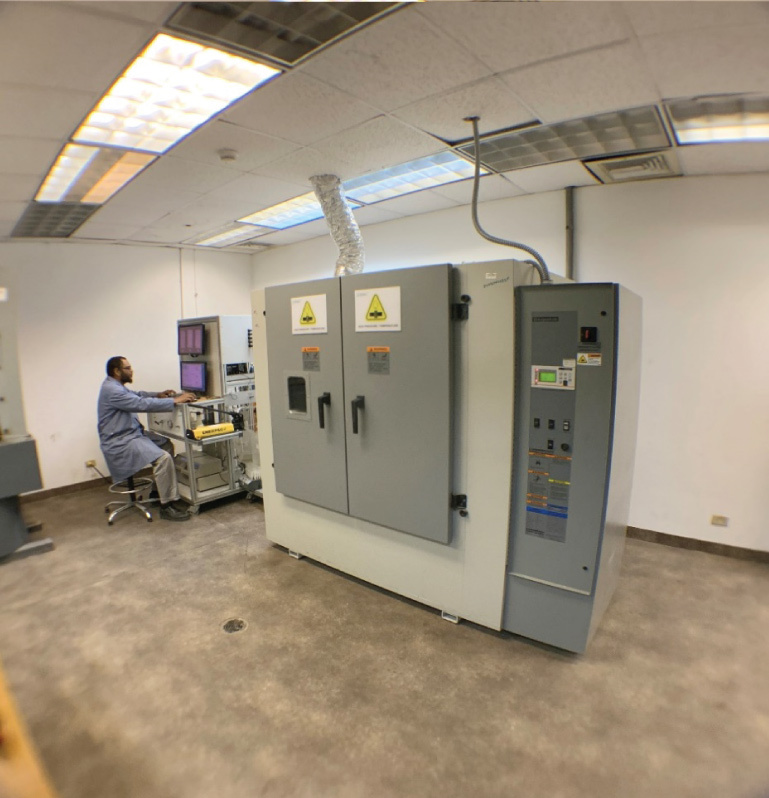 This lab facility accommodates state of art research and teaching equipment, such as GC/MS, Total carbon analyzer, Photo reactors UV/SUN Media, Ion Chromatograph, Gas Chromatograph, Portable GC system supporting all faculty & Graduate Research studies. In additional to Hydrogeology Studies and Geostatistical Modeling, Geology of Ground Water supplies and Hydrodynamics, Water analysis and groundwater. Contact: Tajudeen A. Oyehan for more info. 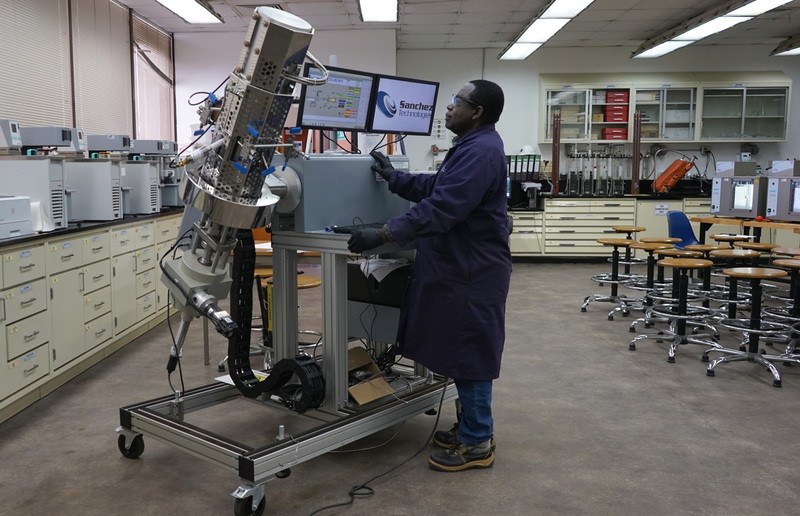 The Geosciences department has a fully equipped rock preparation facility to support researchers in petrographic thin section making make thin sections. The lab has advanced precession thin section preparation machines such as Logitech LP-50, a Thin section precision lapping and polishing machine, a Buhler petro thin, a thin section system, and a Geoform Thin section precision lapping and polishing machine, amongst others. Contact: Mushabbab Y. Al-Raqdi, or Habeeb Al-Abbas for more info. 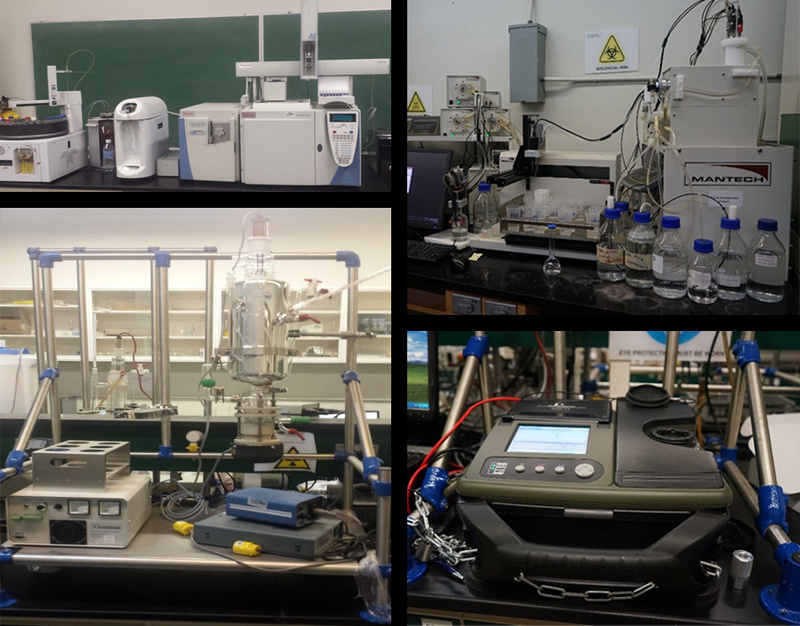 This is one of the powerful state-of-the-art analytical instruments in the Environmental and Hydrology lab. It is useful for detection and quantification of volatile and semi-volatile organic compounds. It is equipped with three important sample injection units; purge-and-trap (P&T), headspace (HS) and direct liquid injection (AS). It is also configured to use solid-phase micro-extraction (SPME) injection. These make the instrument to be suitable for wide range of hydrocarbon and organic compound analyses from solid, liquid and gas matrix. This is used for the treatment of contaminated water. It remediates polluted water by advanced oxidation process (AOP) method. It uses UV radiation (and sometimes) other oxidants to degrade organic contaminants, reducing all organics to carbon dioxide and water as the final product. This is a benchtop multipurpose instrument for measuring electrical conductivity, turbidity, dissolved oxygen, carbonate, hardness, ammonia content, alkalinity, and biological oxygen demand (BOD). 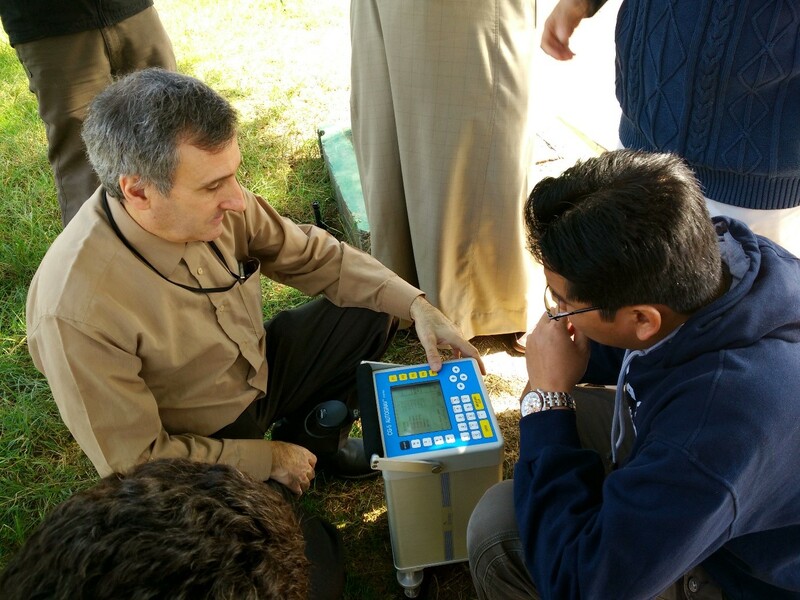 It is a very useful instrument for analysis of the quality of groundwater, produced water and drinking water. This is another important, yet rare, instrument. 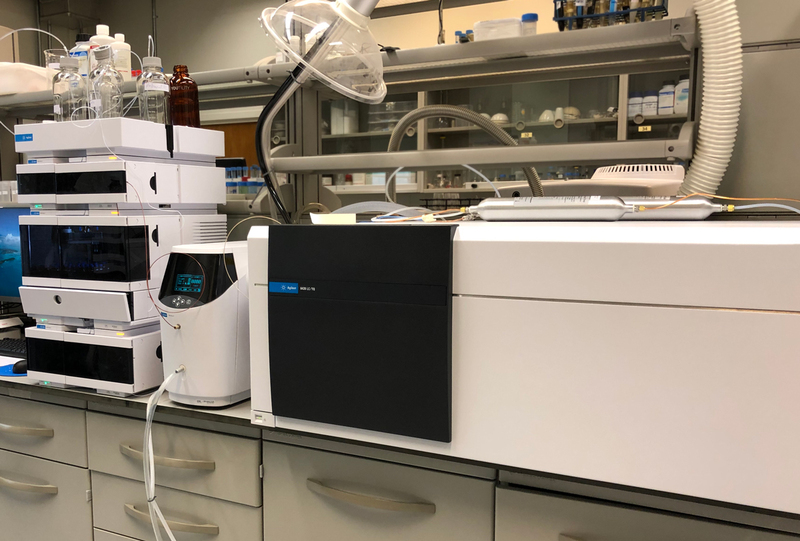 It is designed for quick and rapid analysis of hydrocarbons and other organic compounds in all types of environmental samples (air, water, and soil). It uses SPME and needle trap (NT) for sampling from all types of matrices. It is designed for field sampling and analyses and can be used in the lab as well. Contact: Dr. Bassam S. Tawabini or Tajudeen A. Oyehan or Eyad Safi for more info. 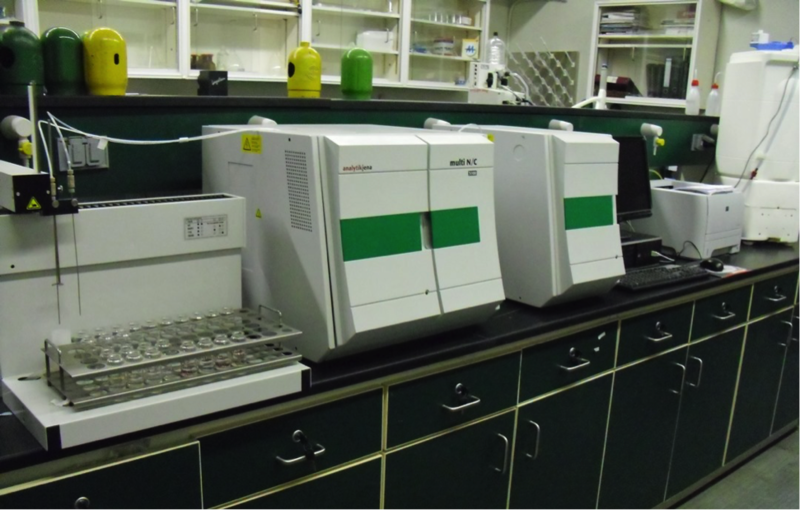 XRD system Empyrean diffractometer includes all the optional items required. The system has all the technical requirements and provided additional features. 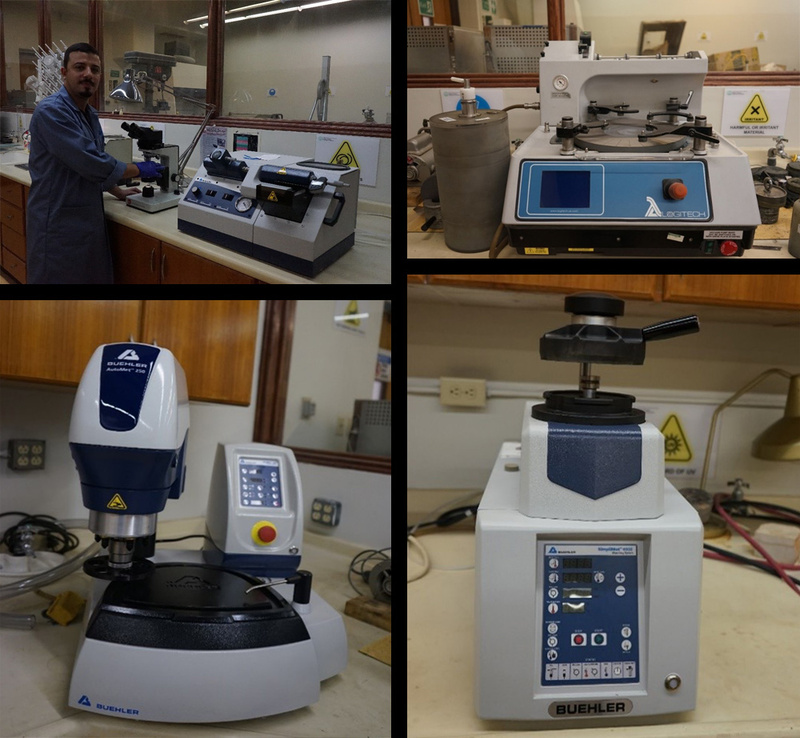 detectors, goniometer, auto-sampler, stage, x-ray source, sample holder and software are the perfect fit for advanced XRD lab applications. The system is recent, state of the art and modular with fully functional support for our future anticipated use. The systems detectors were developed in collaboration with CERN and are used by many reputable universities around the world like MIT, Stanford etc. Contact: Mushabbab Y. Al-Raqdi, or Bandar D. Al-Otaibi for more info. 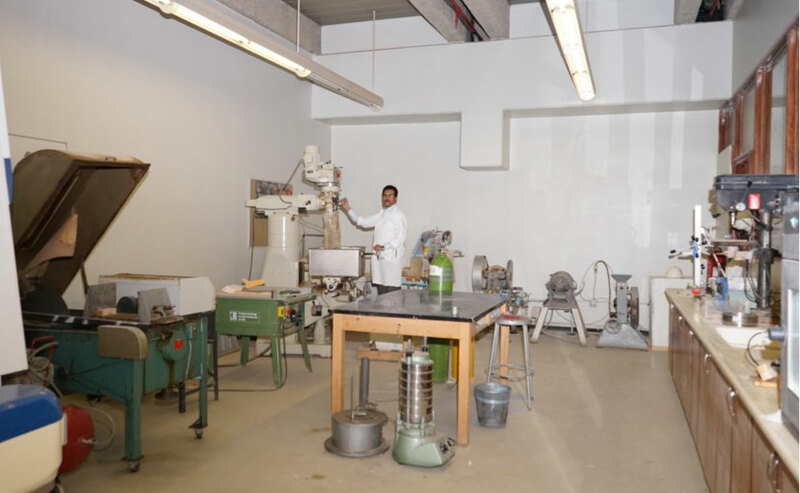 It is a unique and essential facility equipped to support all the sample preparation needs, such as rock slabbing, rock coring, rock sample crushing, sample sieving and mineral separation, sample powdering for SEM, XRD and XRF machines, and sample impregnation. It is being used by all the Geosciences students and researchers. This is a unique laboratory facility available in the kingdom for rock-magnetic and Paleomagnetic studies of the nature, description, and analysis of the present magnetic field, spherical harmonics in applied geophysics, observatory weak remnants of the field, computation of its coefficients, the IGRF, measurement and analysis of the ancient geomagnetic field, theory of rock magnetism, acquisition of remnants by rocks, theories of TRM and DRM, instruments and techniques of Palaeointensity and paleo direction measurement from rocks, analysis and interpretation of Paleomagnetic measurements, applications of Paleomagnetic methods in geology and geophysics. The laser scanning confocal microscope is designed to carry out high resolution imaging of geologic (polished thin sections and slabs), biologic, and hydrocarbons under, polarized, fluorescence and UV light sources. The microscope is fully automated and capable of automated acquisition of 3D images (e.g. pores, droplets, and others) using Z-scan, 4D movies (time lapse) of live fluid-solid and fluid-fluid interactions. Automated drift corrected large area imaging can also be carried out over a large area of section/sample. The microscope is currently equipped with 4 laser light sources and 2 High Sensitivity Spectral Detectors, 2 Standard Spectral Detectors, and a Transmitted Light Detector. Thus 4 different excitation/emission pairs can be imaged simultaneously or individually. Conventional transmitted and epifluorescence microscopy can be carried out using a standard mercury lamp source and UV, Blue, Green fluorescence cubes. Contact: Dr. Johannes J.G. Reijmer or Dr. Luis A. Gonzalez for more info. The Reliotron VII cathodoluminoscope is designed to produce cathodoluminescence images of solids under X-Ray excitation. Although primarily designed for thin section imaging, minerals and thin slabs can be examined with the Reliotron VII. The CL chamber can hold up to three 27 x 46 mm petrographic thin sections, one 51 x 75mm thin section, and small chips or thin slabs up to 51 x 75 mm in area no more than 3.15 cm thick. The CL stage can be set on a macro stand and with a defocused beam areas as wide as 2cm can be imaged and photograph with a convention high sensitivity camera. For microscopy imaging the stage can be mounted on an Olympus BXM53M microscope equipped with a20 MP low-lux camera. Contact: Dr. Luis A. Gonzalez for more info. The department of geosciences has this essential and well-established 120 seconds Trillium Broadband Seismometer system for earthquake recording and monitoring station. This facility is being used for interpretation of earthquakes as and when they happen with reference to Epicenter and other geophysical parameters. 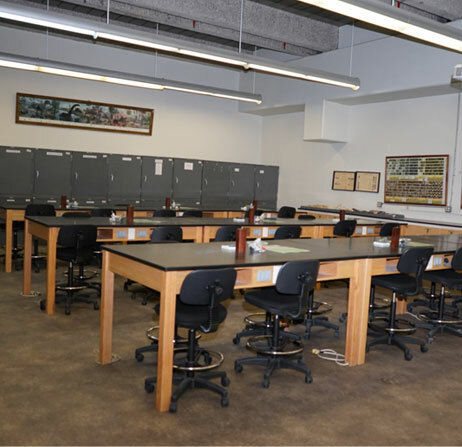 This is an essential teaching lab facility being used for core courses in Mineralogy and Optics, Petrology, Sedimentation, and Stratigraphy. 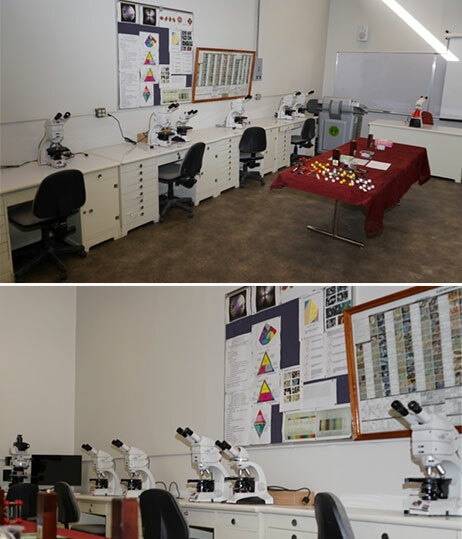 This laboratory facility has been recently developed as a unique microscopy lab with Wi-Fi capable polarizing microscope for digital classrooms set up. With an integrated Wi-Fi router and streaming camera. To directly connect the polarizing microscopes in the lab to Labscope, and to share microscope images via Wi-Fi to HD monitors or projectors with the entire classroom. Students laboratory work and exercises include studies of common rock-forming minerals using a polarizing microscope, morphological crystallography using crystal models, and determination of mineral specimens by physical properties and using a hand lens, and recalculations of chemical analysis. Studies of igneous, sedimentary and metamorphic rocks in hand specimens and under the microscope, exercises on types, texture, and composition of common sedimentary rocks; core description; lithofacies map; facies analyses; correlation. Computer software will be used in stratigraphic column construction and data interpretation. Contact: Syed S. Hamid for more info. This is an essential laboratory facility used for Physical Geology, Historical Geology, Paleontology and Biostratigraphy courses. Students' Laboratory work and exercises concentrate on mineral and rock identification and classifications based on physical and chemical properties, examination of stratigraphic rock samples, index fossils, and their identification, lithostratigraphic correlation, paleoenvirnoments. Introduction to macrofossils and microfossils, including basic aspects of taxonomic theory, classification, and principles of nomenclature. Interpretation of Topographic, paleogeographic and geological maps and cross-sections are tough with Particular emphasis on the industrial application of these forms to aid palaeoenvironmental and biostratigraphic determinations as applied primarily to oil and gas exploration and production. This lab is basically used for the teaching of structural geology, remote sensing and aerial photograph interpretation. Laboratory studies and exercises focus on the interpretation of geological maps and cross-sections and stereographic projection using Schmidt net. Computer software will be used in directional data interpretation, manipulation, and diagram and graph construction.